Ai Wei Wei, artist and dissident a few weeks after his release from illegal detention. Ai Wei Wei in his wharehouse studio. Chen Shu the president of the China Association of Mammoth Ivory Art Research, posing for a portrait at his apartment filled with Mammoth ivory carved objects and tusks. Hong Bin, lawyer. When he was a teenager, Hong Bin denounced his mother to the Red Guards. She was soon after executed. Wang Jindong had his identity files stolen and sold by corrupt officials. With no records of his education it is now near impossible for him to find a decent job. Xiangyuan (Shanxi) January 24, 2012.Li Ke a prolific author of online novels, in his room where he spends hours every day writing. Li runs a double life: policeman during the day and writer when he is not on duty. Wang YuanYuan, one China's leading modern dance choregrapher. Yang Jisheng, journalist and writer, at the office of the history journal Yanhuang Chunqiu, of which he is deputy publisher. Yang is the author of two books both banned in mainland China. "Tombstone", published in 2008, is a thoroughly documented account of the great leap forward. Li Lihua, a Chinese woman doing business in the Russian federation standing in a brick factory, one of four she owns in Blagoveshchensk. Lei Shui Xiang, headmaster of Guan Shan (Gansu) primary school, holding awards. 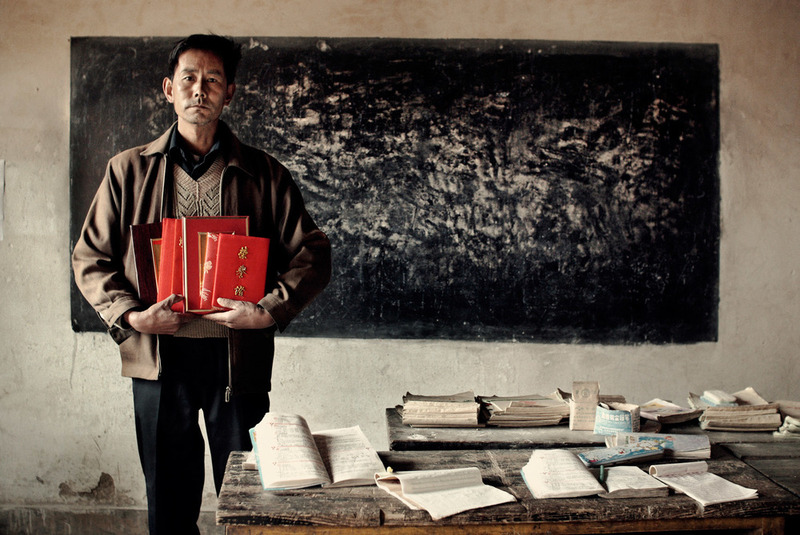 Devoted to the children, covered with academic honors, his monthly income of RMB 150 hasn’t changed in 25 years, in spite of repeated request to have his status changed. A young Tibetan posing in a photo studio in Labrang (Gansu). A young military enthusiast visiting the Military Museum in Beijing. Sidney Rittenberg, one of the few westerners to be a member of the Chinese Communist Party. Mr Rittenberg became a friend of Chairman Mao during the fight against the K.M.T.. He spent 15 years in Chinese jails in the 50's and during the Cultural revolution but always kept supporting the Party and the revolution. He eventually became a consultant for U.S. firms such as Microsoft, who needed help to set foot in China. Worker at subway construction site in Beijing. Liu Wei, an orphan, eating a bowl of noodles at his grandma's who struggles to support him.